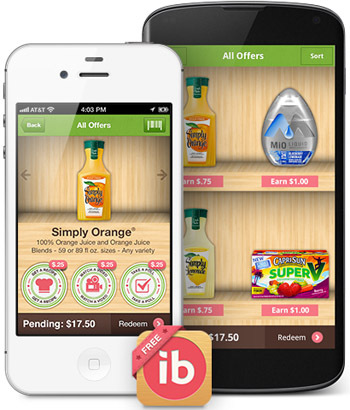 The FREE ibotta app is a fun & easy way to earn extra money while shopping and is available for both iPhone and Android users. Earning rewards with ibotta is super-easy. Think shopping, trivia, and quick cash all rolled into one! Ibotta gives you the opportunity to earn real money for buying your favorite brands at your favorite stores including my favorite– Target! Ibotta works in over 80 retail chains, restaurants, movie theaters, convenience stores, home improvement centers, pet stores, and pharmacies nationwide. Earning opportunities are on many common brandnames – like Dove, Cottonelle, Tide, Kleenex, Tyson, Healthy Choice, Coke and more! Plus, here’s another benefit – you can use coupons with ibotta for even more savings and it will not affect your earnings! Download the FREE ibotta app HERE. When you go into the ibotta app the first time, the rebates are separated into categories: Grocery, Electronics, Health & Beauty, Movies and lots more. 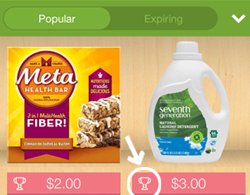 Choose your category and retailer, then select and complete tasks to unlock the rebates you’re interested in. The more rebates you choose, the more cash back you’ll earn. Next, its time to go shopping. It’s very important to read all the details on each ibotta rebate to make sure you are buying the right product for that rebate. Note: In the list of retailers, you can see how many total rebates there are for each one and how many of those rebates are new, as well as the total amount of earnings possible for that retailer. To do this, just tap on the rebate in your ibotta app. Be sure to scroll all the way down for complete Details. You can also tap on the “Not Interested” button at the bottom if you don’t like a rebate. If you repeat this as you go thru the rebates, the app will learn your likes and dislikes and personalize it to your preferences. Another helpful feature is the barcode scanner. You can use the scanner to verify you have the right product before you buy. When you’re in the store, just bring up the ibotta rebate you’re trying to match, then scroll down and select “Verify Product Barcode” – this will bring up the camera to scan the product and tell you whether it’s a match. After shopping, you will need to verify your purchase in the app and upload your receipt. Just tap on the redeem icon at the bottom of the screen and follow the prompts. Make sure all receipts submitted are less than 7 days old. Once your receipt is uploaded, ibotta will verify your purchase(s) and notify you anywhere from 2 – 24 hours that your credit is available. For me, my first receipt was approved within a 1/2 hour! Ibotta can also be linked to select loyalty club cards to bring you earnings without having to upload your receipts. Just link your ibotta app to your loyalty card account, activate your ibotta rebates, then be sure and use your loyalty card at checkout. If you would like to see your favorite retailer link to ibotta so you don’t need to scan your receipts, you can reach out to them on their Facebook page and ask them to write to ibotta at [email protected] to find out how. Ibotta also has Exclusive Rebates which means these rebates are only available at select retailers. These rebates are listed under each retailer and can be found by tapping on the down arrow in the top right corner and then select Exclusive Rebates. There’s one more thing you should know about ibotta —watch for Bonuses! The more you use Ibotta, the more Bonuses you earn and unlock. Some bonuses simply unlock another bonus! Just watch for the trophy icon under the rebate next to the earnings amount. When you are ready to collect your earnings, they can be transferred securely to your Paypal or Venmo account or select from the gift cards listed. If you have questions or need assistance, I found ibotta’s Support Center to be very helpful with lots of instructional videos and easy to follow articles. From their home page HERE, just tap on “Help Center” at the bottom of the page, right-hand side. You can also email their support team directly. Am having serious probems with Ibotta- I need to speak with a real person & cant find a phone # anywhere for them- does anyone know of a customer service contact #??? Do you know if the earnings are considered taxable income?